A lot has changed since I started affiliate marketing in 1999 and wrote the first edition of the Super Affiliate Handbook in 2003. Back then, there were no blogs and no Google. I coded every bit of my first web site in Notepad. Dancing babies, spinning globes and the whole nine yards of ugly elements. In 2019, new webmasters can install their first blog in just minutes and creating content is now as easy as playing with kids’ building blocks. Indeed, WordPress has moved to using block content to make content building easier for every webmaster. Granted, getting ‘found’ online nowadays isn’t quite as easy as it was when I started my 1st website back in 1998. Back then, I submitted my site to Yahoo! and umpteen other directories with site submission services just to get my site noticed and it worked. Now, Google is King of the Castle and webmasters MUST abide by his rules. Considering the way the Internet has evolved, in my humble opinion, that's a good thing. Google rewards those who are consistent. I’ve been so gratified to see bloggers in the travel, food, mommy (parent), pet, fashion and beauty industries earn MILLIONS from their efforts in very short timeframes, i.e. 4 years and less. The point is, that if you blog about a specific topic on a regular basis because it is your desire to share your knowledge about that topic, you WILL be rewarded with results on Google. Moreover, when you add social media elements (Facebook, Twitter, Pinterest) with the same focus and passion, your efforts will be rewarded even more greatly. So, if you have something to share for which there is an audience, you can count on being able to build an online business… even in 2019. 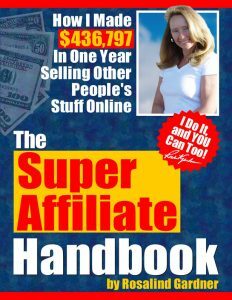 To learn more about becoming a successful affiliate marketer, read the Super Affiliate Handbook: How I Made $436,797 in One Year Selling Other Peoples' Stuff Online – the 2019 version! WHO Ranks #1 on Google for “Super Affiliate”?